Thread: Endurance mode - tips for "Skillful Raider"? Open 5 Codices or Sarcophagi without getting caught in a trap. I'll start by saying this is much harder than it sounds because you have to get through all five in a row, so whenever a trap is triggered, you automatically fail the challenge. In my last effort, just upon entering the second crypt. Went carefully through the third but to no avail as the challenge was already locked out. This makes things much harder than they already are. I kinda wish there was a way to activate the skill that makes traps glow red when using survival instinct, but as far as I know that's a codice skill and so you can't have it earlier. It's entirely possible to avoid the traps; you just need a terribly keen eye. When you know exactly what the traps look like, it's easy to spot and navigate them. Avoid at all costs crypts with floor traps since you're mostly set up for failure. You can't shoot them because that'd fail the challenge. You'll generally find floor traps after reaching the bottom of the crypt at the start, so just leave it and search for another one. It's not worth the risk IMO. Crypts' location and layouts are randomly generated and that means you can be either lucky or play for almost 2h to finally find good ones. The other two types of traps are pressure plates and you can safely shot the switch to deactivate them. Be sure to scan the floor every 5 feet or so and not rush inside the crypts. Use a card that gives you all skills, then the traps glow red when you use survival instinct. Also avoid any crypts with floor traps. You even just brush one and it crumbles and its game over. Avoid bears and mountain lions. I just died with one crypt to go after being chased by two bears - and theres never a climbable tree when you want one!!!! Finally got it this morning in 7 in-game days after numerous tries . Here's a few tips. Skip the crypts that have floor traps. Floor traps will cause you to fail if the trap activates at all. It's just not worth the risk. Some crypts will have one or two floor traps that you CAN walk around and it should be obvious that you can. These are fine as you can avoid triggering these accidentally. If you keep finding crypts with floor traps then it might be worth just restarting the game as it seems to re-randomise them. The other two traps are activated with pressure plates. Just scan the floor continuously using survival instinct and shoot them. Be careful of your return trip out of the crypts in case you missed a trap on the way in. Although not vital, having the ability to see the traps highlighted red makes it easier, particularly for spotting the foot traps, The Tomb Raider or Well Read card will give you this ability unless you are lucky enough to get it from opening a codex or sarcophagus. If these cards are single use don't back completely out of the game at any point, use the restart option so you don't lose it. Keep moving as much as possible, but make sure you always have an eye on warmth. Make sure you know where you can warm up. Carry a lamp wherever possible as it means that you don't have to search for a camp fire or burning barrel as much. This allows you to cover ground a lot more quickly searching for crypts. Crypts always have a campfire in the entrance but it cant be guaranteed if you come across one with a floor trap at the entrance. Make sure you always top up your wood and feathers for fires and arrows. Steer clear of Bears and Mountain Lions, but if you do get caught use your poison arrows and if necessary a shotgun. I used two poison arrows to take a bear out. Be wary around ruins, as I have found bears hang out a lot around them. I started to steer clear of those as well. The achievement pops when you open the 5th codec/sarcophagus. Thanks for the tips. I have a hard enough time finding the crypts, and if I have to avoid the crypts with floor traps that's going to make it even harder. I think it's baloney that if your foot even barely brushes one of the rocks they consider that caught in the trap. I've never seen the Tomb Raider or Well Read cards. Any particular pack that might increase my chances of getting them? I got this a week ago. Took me 9 crypts in total because the falling floor traps seem to trigger a little too easily so I'd avoid them. Your best bet is to just keep moving and hope for good RNG. If you can't get it by about day 15 it gets much more difficult because the cold really starts to go quick in tombs in the higher days. I got the Well Read and Tomb Raider cards by using credits for card packs. I just kept getting the Advantage packs for only 20,000 credits and they turn up eventually. If you run out of credits sell any unwanted cards and keep getting Bronze packs as they are only 5000 credits and reselling the contents more often than not gets you more than the 5000 credits they cost you. You then build up 20,000 credits to buy another Advantage pack. You can do it without these cards but just tread very carefully. 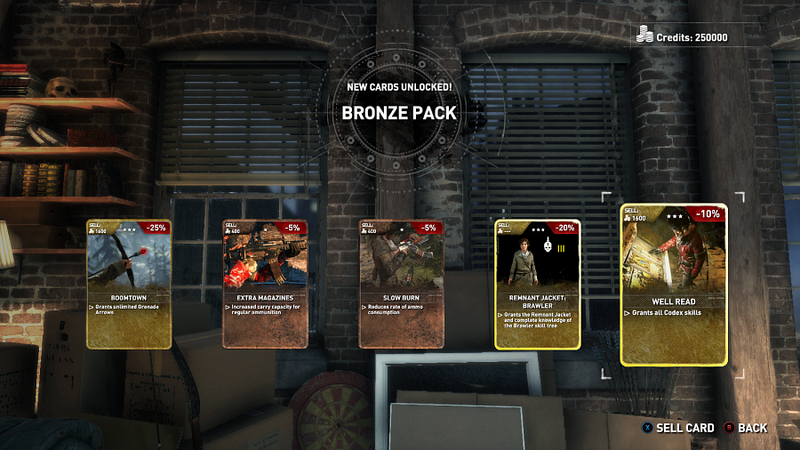 I got Well Read from one of the first few Bronze packs I bought on the Steam version. And as I'd hoped, it's a foil (permanent) card, yay. Sweet, so stick with the Advantage and Bronze packs it appears. I'll give it a try. I need more permanent cards. The best card I have is....well I can't remember the name but it disabled health regeneration and requires bandages to heal. It gives you a 100% score bonus, and it can be used on stages that don't have any enemies! That card is credits in my pocket. It's almost cheating.